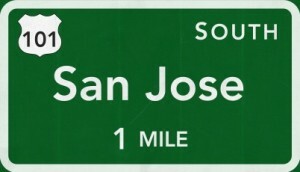 Less than one week remains to comment on important proposed changes to the CEQA Guidelines that flow from the 2013 adoption of “SB 743.” Once phased in, these Guidelines will change the evaluation of a project’s potential transportation impacts and, if the Guidelines function as the Governor’s Office of Planning and Research (OPR) desires, alter the pattern of California land development. Under the Guidelines, vehicle miles traveled (VMT) will replace level of service (LOS) as the standard a lead agency must measure a project’s traffic impacts. Under the new metric, what was mitigation for traffic impacts, such as the widening of roads, will soon be considered a significant impact. Accordingly, the implications of these Guidelines go beyond the need for traffic engineers to retool their traffic models (itself a complex task). Of course changing CEQA is bound to be controversial. OPR’s first Guideline proposal generated numerous and diverse comments, reflecting differences among California’s lead agencies’ size and access to transit, and stakeholders’ individual (often ideological) views on transportation. As a result, OPR issued a second set of proposed Guidelines on January 20, 2016, which can be viewed on OPR’s website. Comments on this latest draft must be submitted to CEQA.Guidelines@resources.ca.gov by 5:00pm on February 29, 2016. As we start to look back on significant new laws approved by California’s Legislature in 2015, climate change once again took a prominent role. In particular, SB 350 ups the State’s targets for the amount of electricity to be generated in future years from eligible renewable energy resources and sold to retail customers, setting the goal of 50% by 2030. The law also requires the California Energy Commission to set annual targets to double energy efficiency in buildings by 2030. With SB 350, California has strongly reaffirmed its role as a leader in the effort to confront global climate change, while also providing a clear signal to renewable energy developers that solar and wind will continue to play a growing role in the state’s energy future. SB 350 also emphasizes the important role of electric vehicles in California’s overall scheme to combat climate change, declaring that “[d]eploying electric vehicles should assist in grid management, integrating generation from eligible renewable energy resources, and reducing fuel costs for vehicle drivers . . . .” The bill promotes the development of additional electric vehicle charging infrastructure to encourage greater use of electric cars. As California developers and public agencies well know, the entitlement process in our state is driven by CEQA, the California Environmental Quality Act. CEQA, in turn, functions pursuant to the CEQA statute and the “CEQA Guidelines.” If you’ve ever wondered who writes those CEQA Guidelines, the answer is “the Governor’s Office of Planning and Research,” or “OPR.” The CEQA Guidelines reflect OPR’s interpretation of CEQA’s statutory requirements, its reading of case law construing CEQA, and its take on “practical planning considerations.” As a result, this little known operation in the Governor’s office plays a pivotal role in California’s entitlement process. CEQA Guidelines are formally adopted by the Natural Resources Agency following review by the Office of Administrative Law, but OPR basically writes the Guidelines. This year, OPR is engaged in two separate endeavors to amend the CEQA Guidelines. One ongoing effort is the product of SB 743, legislation adopted in 2013 which likely will revolutionize the way traffic impacts in California are evaluated and mitigated by focusing on vehicles miles travelled (VMT) rather than level of service (LOS). We have discussed with you in prior “Lay of the Land” posts the potential implications of the new SB 743 Guidelines being prepared by OPR. KEEP AN EYE ON . . .
. . . SEA LEVEL RISE AND THE COASTAL COMMISSION: Prospective purchasers, developers, and owners of coastal land should pay close attention to the Coastal Commission’s development of policies to address rising sea level and its implication not just for coastal resources, but also for existing and proposed development. Although final guidance has not yet been issued, the Commission’s Draft Sea-Level Rise Policy Guidance concludes that sea level rise threatens “seven wastewater treatment plants, commercial fishery facilities, marine terminals, Coastal Highway One, fourteen power plants, residential homes, and other important develop ment and infrastructure.” Add in impacts to tourism, commercial fisheries, coastal agriculture, the ports, and sensitive coastal resources and it is easy to anticipate that the projected risks from sea level rise will create tough decisions for the Commission as it acts on Local Coastal Programs, LCP amendments, and Coastal Development Permits. Hazard avoidance and mitigation are likely to result in proposals for significant constraints on development. Every site and project will be different, but it will be important to evaluate the potential significance of sea level rise over the life of the project in the context of any investment or development within the Coastal Zone. 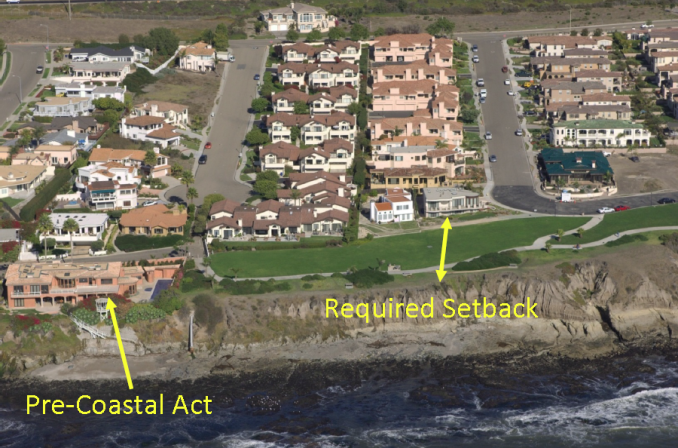 The picture above is from a presentation by Charles Lester, Executive Director of the Coastal Commission, to the Senate Budget Subcommittee 2 on March 20, 2014. 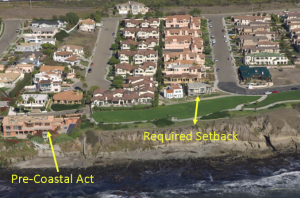 It shows a pre-Coastal Act home and more current setback requirements along a blufftop in Pismo Beach which has been impacted by bluff erosion.
. . . AFFORDABLE HOUSING FEES: We told you earlier this year that the California Supreme Court will be weighing in on the validity of an in lieu affordable housing fee in San Jose. Oral arguments in California Building Industry Association v. City of San Jose (click here to read the appellate court decision which is under review) were heard on April 8. CCN’s Mike Zischke was in attendance and observed an engaged and inquisitive Court. When this decision comes down, its significance likely will go beyond the affordable housing issue. With two new Justices sworn in at the beginning of this year, this decision could foretell where the Court will lean on land use issues, particularly those involving exactions and impact fees.
. . . THE DROUGHT: Governor Brown’s Executive Order calling for a 25% reduction in the State’s water usage will impact not only daily life for Californians (there goes that ten-minute shower), but potentially development proposals. At a time when some areas in the state are experiencing housing shortages, there undoubtedly will be pressure from some interest groups to cut back on the development of new housing. It’s too early yet to understand what the full effect of Executive Order B-29-15 will be, as local water agencies and local governments will be developing their own policies to comply with the Governor’s directive. What Do Lady Gaga, Conan O’Brien, and the California Legislature Have in Common? California’s severe drought has set off alarms from the Capitol to the sound stages of Hollywood. The Governor has declared a State of Emergency and both Lady Gaga and Conan O’Brien have starred in “Save Our Water” public service announcements to promote water conservation measures. On the more impactful legislative front, the California Legislature has passed three pieces of legislation that together make up the “Sustainable Groundwater Management Act.” This new regulatory program may have significant land use implications, particularly in the case of general plan amendments, as it potentially adds a new layer of review to the entitlement process. The Potential Impacts of SB 743: Did the Legislature Double Dribble? Co-contributors: JoAnn Hadfield of PlaceWorks, Tim Paone of Cox Castle & Nicholson, and Tony Petros of LSA Associates and a member of the Newport Beach City Council. It went in as a bill to streamline approval of a basketball arena. It came out, in addition, as legislation that revolutionizes the way traffic impacts are evaluated under CEQA. SB 743 will change the focus of CEQA traffic impact analysis from avoiding or mitigating congestion to reducing greenhouse gas emissions and promoting multimodal transportation and infill development. It eliminates traditional “level of service” (LOS) analysis as the measure of traffic impacts and replaces it with “vehicle miles traveled” (VMT). The Governor’s Office of Planning and Research (OPR) was directed to prepare CEQA guidelines to implement this change. A “discussion draft” of proposed Guidelines was released in August. When and if approved, the Guidelines will take effect in “transit priority areas” immediately and then statewide in 2016.